On Thanksgiving Day, we visited my family's house for lunch. 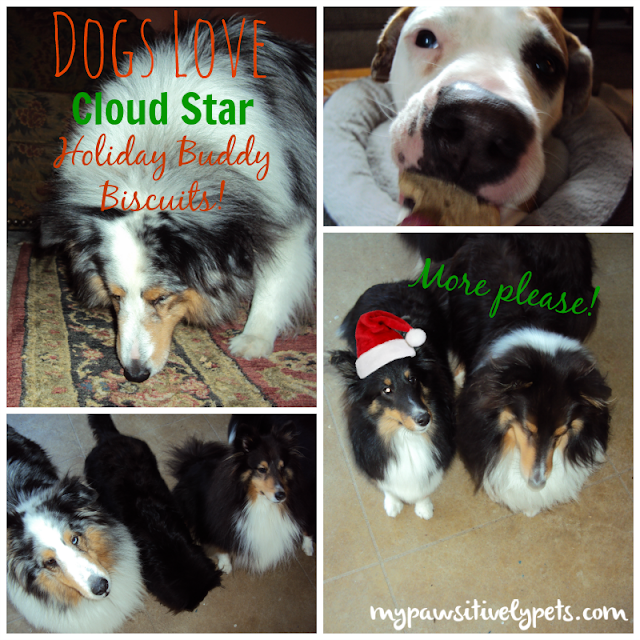 I received some Cloud Star Holiday Buddy Biscuits to review and thought they'd be a big hit with the crew of dogs over at the family's house. My grandparents have one blue merle Shetland Sheepdog named Bear. My aunt now has four girl tri-color Shelties too. That's a total of five Shelties! It was Sheltie mania and lots of fun. I handed out a few Cloud Star Holiday Buddy Biscuits to the dogs and they kept on coming back for more. Just look at those hungry faces! The dog treats looked so cute and smelled so good that I had to take a bite of one. It was pretty tasty! I'll admit a little bland for my human taste, but they aren't loaded up with sugar like human gingerbread men are. Of course, Shiner has also been taste testing the Cloud Star Holiday Buddy Biscuits on a regular basis. She enjoys these treats. We recently tried Cloud Star treats for the first time and love the company. 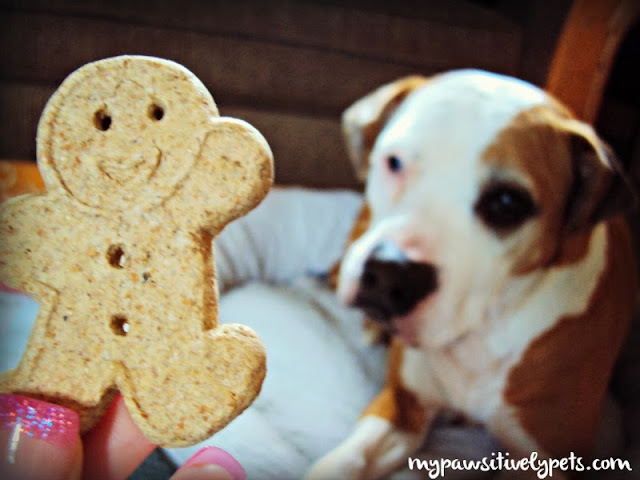 You might remember our recent Dynamo Dog Functional Treats review. I like their Holiday Buddy Biscuits because they don't have a lot of strange ingredients in them. There are only 5 ingredients in these dog treats... yep, 5. That's it! They're also corn-free. And they are made in the USA with recyclable packaging. 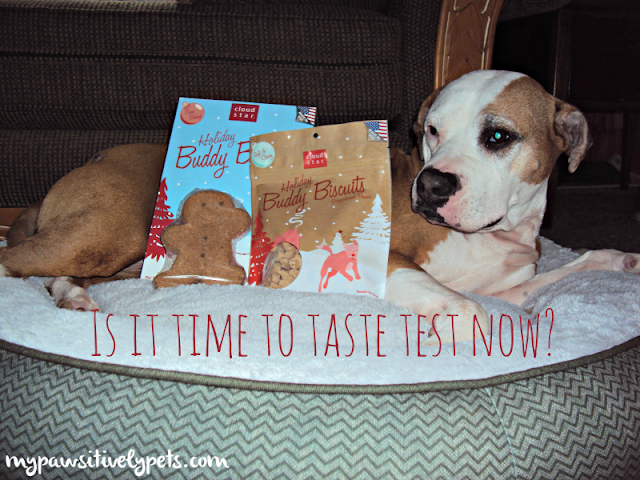 If you missed it, we included Holiday Buddy Biscuits on our 2013 Holiday Wishlist for Pets. As pictured above with Shiner, Cloud Star also makes Holiday Soft & Chewy Buddy Biscuits in Gingerbread Flavor and Holiday XXL Buddy Biscuits also in Gingerbread Flavor. 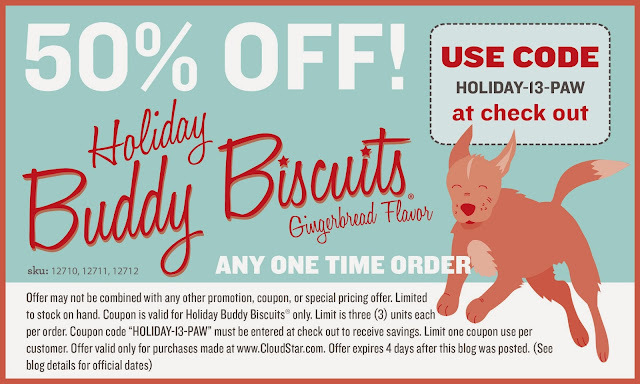 The nice folks at Cloud Star are offering a special discount on their Holiday Buddy Biscuits for Pawsitively Pets readers. Receive 50% when you purchase Holiday Buddy Biscuits from Cloud Star's website! Just enter the code "HOLIDAY-13-PAW" at check-out. Place your order fast because this deal is only good until Friday, December 6th. See the coupon below for full details. Hope your dog enjoys them as much as we did! *We received the treats mentioned in this post at no charge in exchange for an honest review. Sounds pretty good, even if a little bland for our human tastes. Great review. Those sure are some mighty pretty dogs and your family's house and looks like they really enjoyed the biscuits. Glad you got some too Shiner. Hope all of you have a great day. Thanks Marg, they are very pretty dogs. 2 of them are just barely one year old I think. They are the best! We love any Buddy Biscuits but these are over the top tasty! Shiner does love her food! Great pics Ann! I still have yet to try these Buddy Biscuits but I'm very intrigued (especially at 50% off)! They are affordable even at regular price, so I think 50% is pretty awesome! Great deal! I don't think we've ever tried this brand, but they sound very good! I think I went more into detail about the company in my first review of their treats. Love them! They look delicious! And what a great deal! Thank you for sharing! They look very yummy. Great deal as well! I'll have to check them out. I don’t think I’d enjoy these. Sadly I don't think so either CK =/ Cats don't seem to have much of a taste for gingerbread I guess. Cloud Star is our favorite! Wag more, bark less!